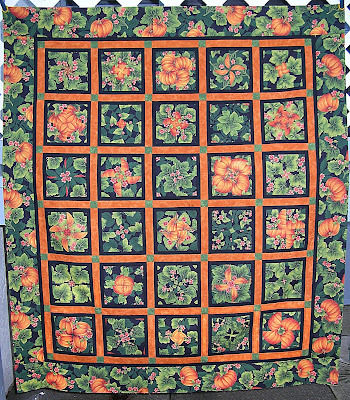 This entry was posted in 4-Patch Stacked Posies, flimsy, pumpkin by Norma Hanson. Bookmark the permalink. Very pretty – I love it! I am going to have to break down and buy the pattern so I can do one someitme. Lovely! I’m such a sucker for a radiating design. Norma, It’s really pretty! That pumpkin print makes some beautiful designs in the blocks. I love it! You will be ready for next fall with this one closer to done. Bet you get it quilted in no time once the customer obligations are done. Hi Norma, love your pumpkin patch..what a lovely quilt this will be! And the one on your bed is no slouch either. IT’s just spectacular! I know that guilty feeling Fun flimsy. This top is fabulous, too! That’s great – you wouldn’t guess that it was only a stacked 4 patch, the design looks like it might be a 6 or 8 patch combo instead. loved catching up on your posts..hope you are through the customer quilting and can quilt some of your own quilts!